This impressive 3.0m x 4.2m Superior Shed installed in Lewisham, London is to be used as a base for the customers carpentry business. Part of our wider range of garden sheds, this model incorporates many features such as heavy duty flooring, an electric pack and floor insulation, together with a work bench, which provides additional storage space underneath. 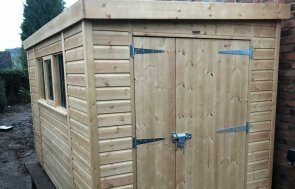 This particular shed also benefits from a partition, giving the customer the chance to organise their tools and equipment as they like. The exterior featured Velux roof windows, to make the most of the natural light, together with shiplap cladding, which was coated in our light oak preservative. All of our buildings are fully customisable to your exact requirements thanks to our bespoke build process. At our factory HQ in Norfolk, our expert craftsmen hand-make garden buildings to customers individual specifications using the finest Scandinavian timber sourced from a partner mill in Sweden. We only use Scots Pine from this supplier so we can be confident that the material we use is ensuring our products are fit for longevity and that every step is managed in a sustainable way. You can experience the quality of the material - and therefore the buildings - by visiting one of our seven UK show sites. 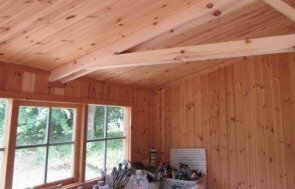 Alternatively, take a look a the full range of sheds by clicking on the link below.